I don’t know what it is about fall that makes me want to eat nothing but soup. I’d say it’s the chill in the air, but since we had an unusually warm beginning to October in Chicago like I mentioned last week, I know that can’t be the only factor. Come the beginning of fall, like clockwork, I always want to eat soup for lunch and dinner almost every single day. 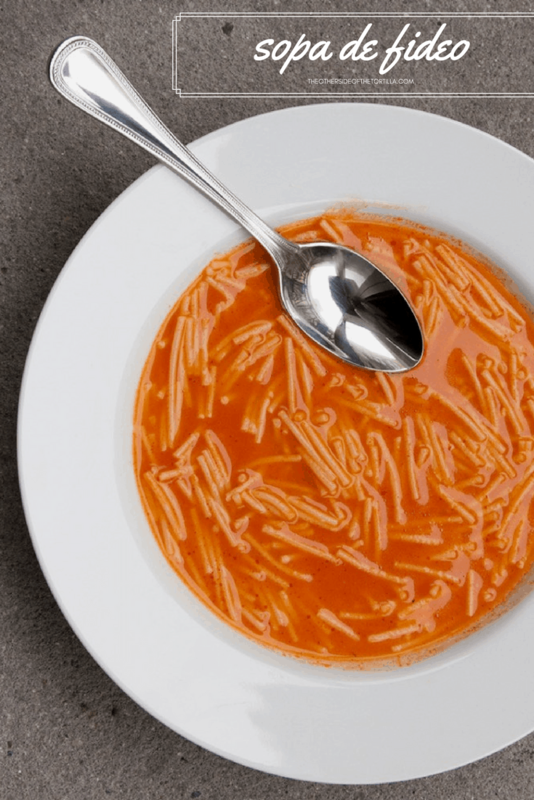 Now that the weather is cooling off, I have an entire page-long list of all the soups I want to make at home. This particular recipe is one I’ve eaten many times in Mexico and I consider it to be a comfort food. 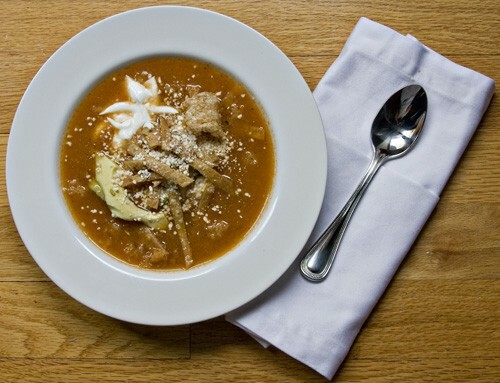 During my visit to Mexico City last month, Luci, the family cook, made this as a first course for lunch on a chilly and gloomy afternoon and it was exactly what I needed to lift my spirits. When I returned to Chicago, I was really missing our family so I decided to make this soup to cheer myself up. The truth is, there’s something about making recipes that I’ve eaten in Mexico that makes Chicago seem like it’s not so far away from the people and places I love in Mexico. Before the soup was even finished cooking, José said, “huele a mi casa.” (Translation: “It smells like my house.”) There are few compliments that warm my heart more, and I was feeling a little better already…. 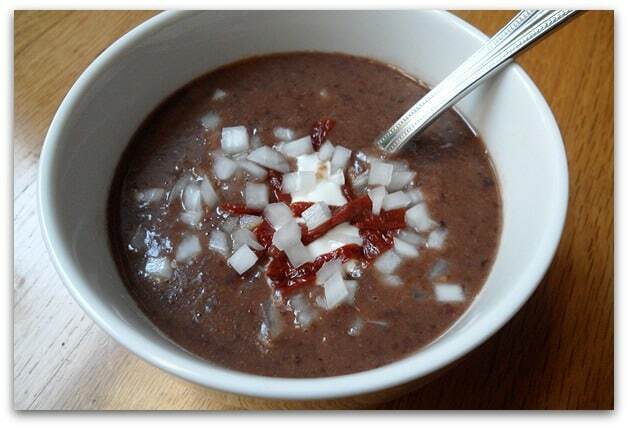 Check out this fantastic and hearty black bean and chipotle chile soup I made this week. There are three reasons I love this recipe: First, you can make it in the blender—so it’s very easy to clean up afterward. Second, the whole recipe from prep to bowl can be made in 15 minutes or less! And last but not least, this recipe is very healthy—it’s low-fat and high in fiber. It makes a great first course if you divide into smaller portions, or with a little bolillo roll and butter, it can make an excellent and filling lunch or dinner. Last month at my cooking show at the Kenmore Live Studio where I made chilaquiles, I talked about the versatility of salsa verde. I can think of about a dozen uses for this sauce just off the top of my head, so when I make it, I usually make extra so that I can get a few different meals out of it. 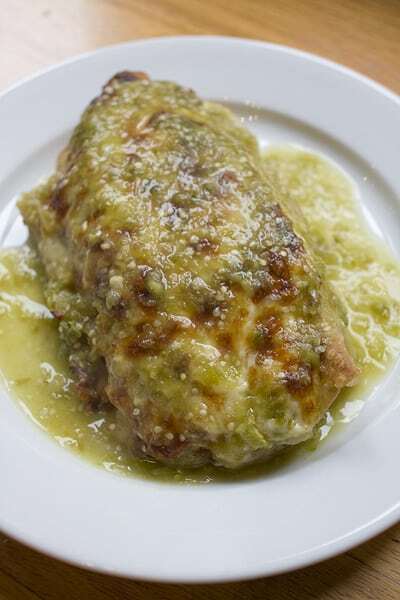 One of my favorite things to make with salsa verde is enchiladas. This recipe is so easy to make; great whether you need to feed just a few or a whole family. A few weeks ago, I made these enchiladas for my suegro and he ate three helpings! I laughed and asked him whether they were that good or if he was very hungry and as he was about to take another bite, he said “both!” These are also a favorite of José’s. 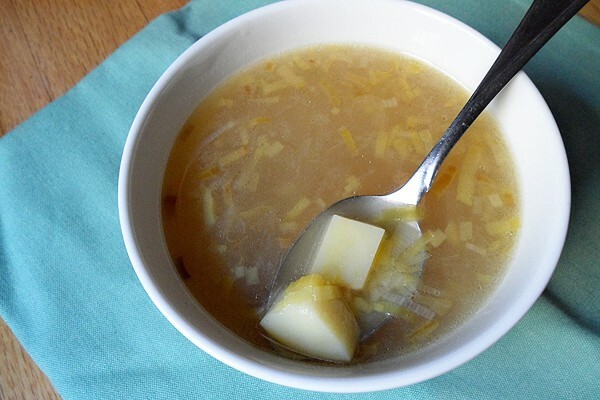 If you want to make these vegetarian, you can substitute vegetable broth for the chicken broth in the salsa and fill them with cheese instead of chicken. First, husk and wash the tomatillos. Rinse them well in cool water. Fill a pot with water (large enough to fit all the tomatillos) and bring to a boil. Put the tomatillos in and cook in the boiling water until the tomatillo flesh begins to get transparent. Using a slotted spoon, transfer the tomatillos to a blender. Add the onion, garlic and salt. Cut the stems off the serrano chiles and cut each chile into a few pieces so they’re easily chopped in the blender. Start by adding 2 chiles to the blender with about ¾ of a cup of water or chicken broth and blend on high until smooth and the chiles and tomatillos are completely incorporated. Taste the salsa to see if it’s too hot; if it needs more chile, add them one at a time, blending & tasting the result until you are happy with the level of heat from the chiles. If it seems the salsa is not quite liquid enough, add another ¼ cup of water or chicken broth. The salsa will reduce slightly when cooked. Pour blender contents into a saucepan and cook over medium heat until the salsa boils, occasionally stirring. Remove from heat. For more on salsa verde, visit my original post on the topic. You can either make a bone-in chicken breast from scratch or use a store-bought rotisserie chicken if you’re short on time. For bone-in chicken breast and chicken stock, you can just gently boil the chicken on the stove with a pinch or two of salt, a slice of onion and a small spring of cilantro or a few epazote leaves until the meat is cooked through. If you use a rotisserie chicken, buy one that’s low-sodium or barely seasoned. You can pour the juices from the container into a saucepan with a few cups of water and a chicken leg or two. Preheat the oven to 350º F (177º C). Heat a little bit of oil in a frying pan (just enough to coat the bottom of the pan) and lightly fry both sides of the tortilla. Each side will dome up when it’s ready to be turned. Drain on paper towels. Put a bit of the shredded chicken in the center of each tortilla and add a generous pinch of the shredded Chihuahua cheese. Roll them up and place seam-side down in a baking dish. Spread the crema liberally over the top of the enchiladas and then ladle some salsa over them. Sprinkle the remaining cheese over the top and heat in the oven at 350º for 8-10 minutes to heat through. Then move to the top rack and broil on low until the cheese is completely melted and bubbly, with some brown spots. Remove from the oven. Using a spatula, transfer enchiladas to plates and finish with some extra salsa on top. Yields 12 enchiladas. There will be some leftover salsa. How do you like your enchiladas?